Fairfax County Fire and Rescue's Recruit School 143 class gathered with friends and family Friday night to celebrate their graduation. But one future firefighter will remember that night forever for another reason. 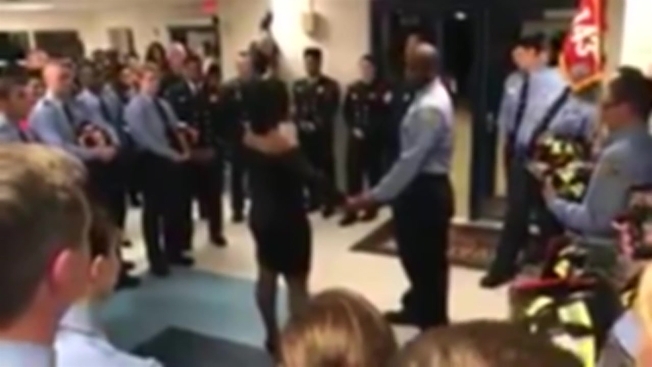 Richard Burton got down on one knee and proposed to his girlfriend during the ceremony -- and the sweet moment was caught on video posted to the department's Twitter. "You've been with me through thick and thin," Burton said as he held his soon-to-be fiance's hand. "You've seen me on my best days; you've seen me on my worst days." "For the past six months, you've been waking up with me every morning," Burton continued. Cheers and claps burst from the crowd as Burton pulled out a ring and got down on one knee. And to no surprise... she said yes! A circle of colleagues and family members whistled and screamed in excitement around the couple as they embraced.